Why just sit by the ocean, when you can sit OVER the ocean on a spacious lanai? Poipu Shores 101B’s huge outdoor lanai, which is shared with the next door condo, is the prime spot for the whole ohana - family - to watch the sea turtles swimming through the blue waters of the Pacific. When you are ready to put your feet in the sand, Poipu and Brennecke Beaches are just a quick 5-minute walk away fun in the sun. 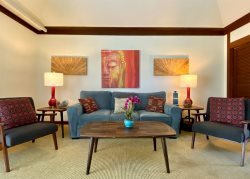 One of two one-bedroom condos in Poipu Shores, the first-floor property is outfitted with high-end furnishings, including amazing art pieces made by local artists. An open floor plan creates an airy and bright atmosphere. Put your feet up on the couch, flipping through the channels on the flat-screen TV. The fully-equipped kitchen features handsome cherry cabinets and granite counters, plus all the basics for whipping up meals and snacks. Start your day with a cup of Kauai Coffee Company java at the 2-person bistro table with the ocean right out the large window. Tasteful tropical beach décor in greens and blues lulls you into a relaxed state in the bedroom, while the king bed assures you’ll get a good night’s sleep. The bedroom also has a mirrored closet, flat-screen TV and en-suite bathroom with granite counters and tub and shower combination. 1. Pacific Ocean Front and Center: You can’t get more oceanfront than this! The condo sits right on the shore, with a roomy lanai that actually stretches over the water. Shared with the condo next door, the 500 square foot lanai has plenty of seating for watching the sea turtles play below. During the winter months, you'll also get to watch the humpback whale migration. 2. Air-Conditioning: Both the living room and bedroom have air-conditioning for those extra steamy Hawaiian days when the ocean breezes can't cool you down. 3. Gorgeous Pool: When you need a break from the sand and the salt, head to the pretty heated pool sat right over the water. In the evenings, gather with your fellow guests in the grassy area next to the pool to watch the spectacular sunsets. If you’re looking for a resort-style stay, we have you covered. For an additional fee you’ll have uninhibited access to the Poipu Beach Athletic Club, home to a fitness center, hot tub and sparkling pool with a waterslide and sand-bottomed kiddie section - everything you need to work out, cool off or wind down. Spaces are limited. MEMBERSHIPS ARE LIMITED, PLEASE LET US KNOW IF YOU WOULD LIKE TO SECURE A MEMBERSHIP PRIOR TO YOUR ARRIVAL. Parking is limited at Poipu Shores. There is only room for one car per condo. First floor unit with stairs to entry. You must stay at 101B Condo - this place was truly amazing. It was very clean, GREAT location to nearby beaches, snorkeling, food, and local attractions and we had all the amenities we needed. We woke up every morning, ate breakfast on the private deck/balcony and watched the sea turtles right outside the door to the condo - pure happiness and awe inspiring! The hospitality was warm and inviting and Great Vacation Retreats's were so responsive with communication. The view is spectacular. We loved sitting out on the lanai. We saw about 5 turtles, stings and dolphins from the lanai. You are walking distance to the beach which was nice. The ac was broken when we arrived but the hosts were on top of it and had it fixed in no time. Review from Airbnb for Poipu Shores 101B dated 11/26/18: You must stay at 101B Condo - this place was truly amazing. It was very clean, GREAT location to nearby beaches, snorkeling, food, and local attractions and we had all the amenities we needed. We woke up every morning, ate breakfast on the private deck/balcony and watched the sea turtles right outside the door to the condo - pure happiness and awe-inspiring! The hospitality was warm and inviting and Great Vacation Retreats's were so responsive with communication. Review posted on Airbnb for Poipu Shores 101B on 11/18/18: The view is spectacular. We loved sitting out on the lanai. We saw about 5 turtles, stings and dolphins from the lanai. You are walking distance to the beach which was nice. The ac was broken when we arrived but the hosts were on top of it and had it fixed in no time. The property was as expected. However it was not very clean. Under the fridge is caked with food, dishwasher has a foul smell when started. Vents and Ac are extremely dirty. The place could use a deep cleaning. MANAGER RESPONSE: Mahalo for letting us know. We will send housekeeping asap for a deep clean and are sorry the property was not as expected for your arrival. Most guests don't like to be bothered during their stay, which we understand, but we wish would would have been able to fix the cleaning while you were here so you could have enjoyed the property more fully. While it may not be your team directly, my interactions with the staff at the property itself was not great. The individual at the location where guests receive parking permits was not great. MANAGER's RESPONSE: Yes, you are correct Kyle. That is not our staff at Poipu Shores. I am sorry that the Poipu Shores folks were not great. We have always gotten a prompt and courteous response whenever we have had a problem or question. You can't beat this location. The view and proximity to water can't be topped. Waves, turtles, whales, dolphins! Great location by the sea. Turtles, whales and close to Poipu beach. The only negative is the sound of the waves hitting the rocks outside the windows made getting to sleep a challenge and early rise when the sun came up due to the bamboo blinds. The location is wonderful. The large sea turtles and big waves crash below the deck. It is a few blocks from poipu beach. There are many restaurants a short drive away. This is about 25 minutes from the airport. The condo itself is cute, efficient, and peaceful. My boyfriend and I had a wonderful time at GVR's Poipu Shores 101B! The best aspect, of course, is the oceanfront lanai. We spent most of our time out there watching sea turtles swimming nearby or enjoying a glass of wine at sunset. Overall, the unit is exactly as pictured. The folks at GVR are also very responsive which we appreciated. A few items worth noting - the space wasn't as clean as I'd expect (floor of the bath tub is stained from so much use and front door handle needs replacing, there were also stains on the pillow cases of the bedding). There is also no cell service in the unit. This was difficult for us initially as there was a storm during our first day/night which disconnected the wifi from 3pm until about 10am the next morning (a fairly long time after the rain had stopped). We got our iPad and my boyfriend's cellphone to connect to the wifi afterwards, but my cellphone was never able to connect. A bit inconvenient for me, but since we had the iPad it wasn't detrimental to our trip. Nonetheless, we enjoyed our stay very much and would recommend to anyone. The lanai can't be beat! We loved staying at 101B through Great Vacation Retreats! It was a perfect place for our Honeymoon. It had the perfect amount of space, and was very clean and comfortable. The private deck (shared by the room next door) was such a treat. We saw turtles below the deck everyday and even caught a glimpse of reef fish. We would definitely book through them again on our next trip to Kauai! This is a great place and we loved our stay! It's less than a 10 minute walk down to Poipu Beach and you can't beat the views! We enjoyed many breakfasts, dinners, cocktails and morning coffees out on the deck. The deck is shared with only one other unit so it's super private and exclusive. It was the envy of other guests at the complex! The pool is also right above the sea cliffs which is cool on its own but is also very well maintained and great for afternoon dips while listening to the sound of waves! Poipu Shores 101 B truly is the most beautiful place I have ever seen. The views from the condo and private Lanai are absolutely breathtaking. You don't just have an ocean view, you are ON TOP of the ocean. Everything about this place is magical and I will definitely be staying there again. We LOVED our stay in Poipu Shores. The views from the balcony were amazing. I loved watching the turtles. This location is great for exploring the canyons, south shore beaches and you're convenient to Lihue! Chantel was perfect for our needs. She established good communications services at the outset, before we left home for Kaua'i; and remained consistent throughout our stay. She responded efficiently with a smile to our needs and is in large part responsible for our positive experience with your company. 101B was perfect for us. Private enough, comfortable for two, a working kitchen simple to use on a daily basis, thoughtful amenities and a very good location at the ocean in Po'ipu. Love the pool, disappointed in the cleanliness of the unit. MANAGER RESPONSE: Mahalo for your review. We did get your comments and are sorry you had some disappointments during your stay. Unfortunately, the part for the washer repair did not come during your stay. It has come since and the washer was repaired and is working now. I don't think you took us up on our offer to do your laundry for you, but appreciate your patience with the issue. We have replaced the pans in the kitchen and the blinds are being repaired this weekend. Thanks again for letting us know and we do hope to see you again in the future! The team was friendly and prompt. While there, we contacted the office to check on booking the same unit for next year. Very quick response and terms for repeat client were appreciated. You can't get any closer to the ocean. The deck which is shared with only one other unit more than makes up for the small condo. Never felt cramped. And the A/C really helps keep place comfortable. Location is excellent. Even with doors closed and air conditioning on, the waves are very loud! The condo was clean and the kitchen was well-equipped. The lanai right next to the ocean was perfect for sunrise and sunset watching. The hosts were very friendly and responsive. It was great to come home to a quiet spot on your private lanai to relax and enjoy the ocean views. A world of difference compared to staying at a large resort regardless of the hotel's star rating. We worked with Lynn H. for reserving the condo. She was very prompt in communicating and was helpful along the way. AMAZING VIEWS! PERFECT LOCATION! If you are looking for an upgraded,fancy unit - this is not it. But if you are looking for a comfortable place to stay with spectacular views -- THIS IS IT! We appreciated the AC and the washer/dryer in the unit. That made travel with an infant so convenient. The kitchen was well stocked and as were the basic amenities. I've already started recommending this place to friends and family! We can't wait to be back :) Thank you for letting us stay in your unit! MANAGER'S RESPONSE: Wow, what a great review. Thanks for recommending our condo to your friends and family. I hope we get to see you again someday!! !